How to draw basic robot easy to follow step by step drawing. This tutorial are very basic robot, it is very useful when you are trying to get down a rough idea for your thumbnail design. 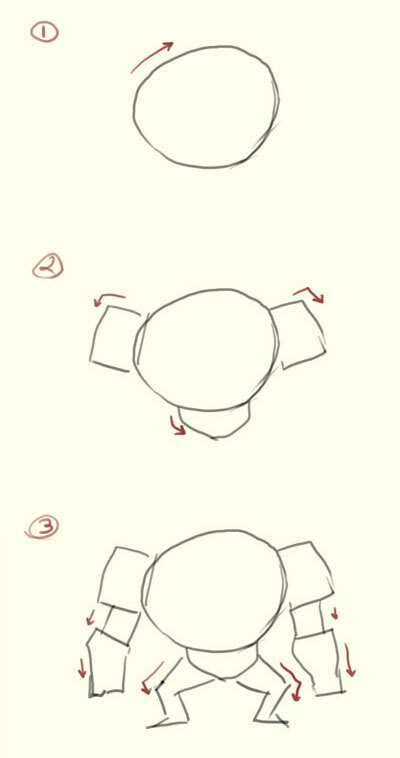 This is a very basic step by step how to sketch in the first stage whenever I want to start to come up with concept idea. I usually do this really quick, it should take no longer than 3 to 5 minutes. It’s a thumbnail sketch, and I do a lot of them in the sketch book just to get variation of ideas before I decide with on to pick and finalize. You could probably do it 7 to 10 in a row and take a break. Pick one or two you really like. Then do more until you have about 30-40 robot in different poses if you may. 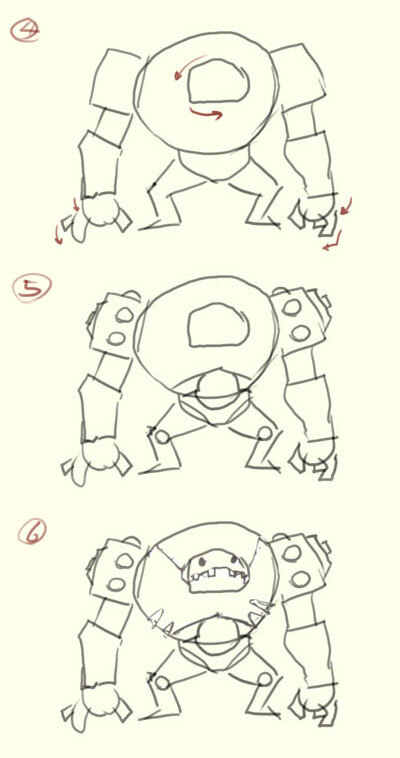 Below are step by step how to draw basic robot. Step one, I start with its body shape, I was thinking round circular shape. Step two, I added big square shoulder pads and pivotal pelvis. 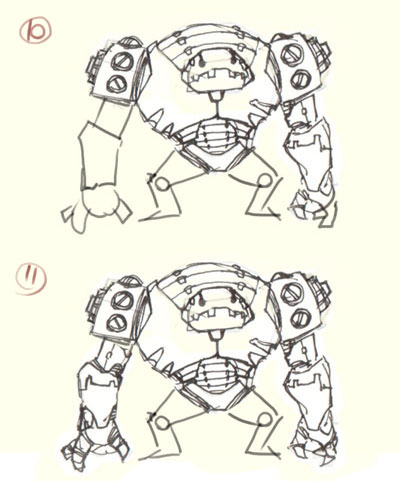 Step three, I draw two huge mechanical arms and smaller legs. Step four, I place its head right around the middle of its circular body and draw hand with fingers. Step five, I draw out big over size bolts around the shoulder pads and huge rotating gear at the end of the pad or side shoulders. 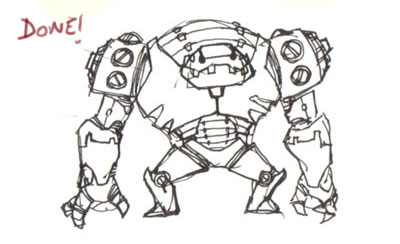 In six, I draw his face with big robot smiley teeth. After step six, most of the body, shape and proportion are in place. Now I just need to draw in mechanical detail and make it industrial or man made clunky looking. And done! Easy tutorial for beginners like me i like drawing & painting. I have tried drawing robot but i take too long for me as i found it difficult. But this tutorial gave me an idea of how to make it quick.